Examples, solutions, videos, activities, and worksheets that are suitable for A Level Maths to help students learn about arithmetic progression and how to find the nth term and the sum of the first n terms. The following diagrams give an arithmetic progression and the formulas to find the nth term and the sum of the first n terms. Scroll down the page for more examples and solutions. 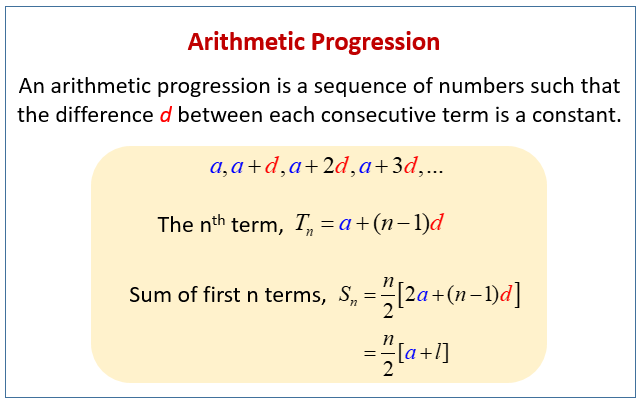 In this video tutorial you are introduced to what an arithmetic progression is and how to find the nth term and the sum of the first n terms. In this tutorial I show you how to prove the formulae for the sum S(n) of the first n terms of an arithmetic progression which is often asked in exams. How to prove the sum of n terms of an arithmetic series?